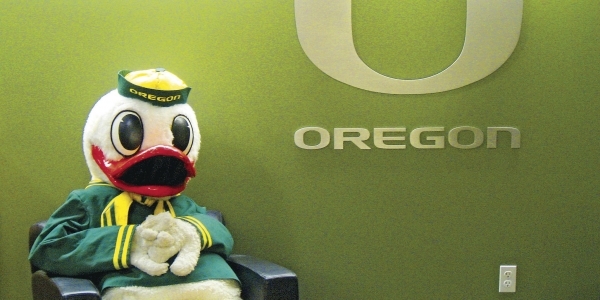 Stick with the sports pages, and the University of Oregon is a school with a national reputation–AND a cute, one-of-a-kind duck mascot. But behind the duck and the flashy Nike uniforms is a university, one with challenges typical of public higher education in our time. Chronicle of Higher Education Senior Reporter Jack Stripling lays out the challenges in a recent article, “An Academic Reputation at Risk.” His work gives a history lesson, a state-of-the-university assessment, and views to the future from key UO players. Jack Stripling joins us to talk about his work. I haven’t had time to listen, comments welcome. Tagged branding, Michael Schill, Realignment. Bookmark the permalink. “So what we did is we were looking very strategically – and this was done not by me but by the provost and the dean of the college.” What a coward Shill is. Blame the firing of all the NTTF on the provost and the dean. Real classy. I wonder if this is the prelude to dumping Andrew Marcus as CAS Dean, as a friend of mine predicts. After Andrew took a heap of troubles upon himself to do what Big Mike wanted. I hope my friend is wrong. I agree. Coltrane should have taken responsibility for the cuts, given that they were in large part the result of his decisions – or lack of decisions – as CAS Dean. Marcus stepped up to the plate and showed some leadership on this. Agreed. Andrew Marcus has shown leadership in a number of tough situations.He has also shown the ability to listen to faculty and change his mind. Yes, some major league buck passing going on there. Wherever the plan for dropping the NTTF came from originally, he ought to take responsibility for such a drastic move, done with little regard for its impact on the teaching and research of those (TTF and NTTF) who remain and less regard for NTTF who have given years of good service to the university. To say “Where we didn’t renew the nontenured faculty are in areas where students stopped taking classes” is a half-truth and doesn’t get around the fact that departments that provide lower division “service” courses are now scrambling to figure out how they’ll be taught. Thanks for posting this, Old Man. We fetishize our AAU membership here but as far as I can tell few of us know what the organization actually does. What precisely are the benefits of our membership, and how do they compare with the costs of further academic engagement with the military? Mike, you sound so egotistic and narcissistic! Just do the job and let others judge, and things will work a lot better for you. So far, the jury is very much out, in my opinion. And — you were not the only UO president within memory who showed “leadership.” True, there was a gap after Dave Frohnmayer. But Paul Olum, Myles Brand, Dave all guided this place through some very tough times, and/or largely are responsible for the circumstances in which you are able to try to “build a great university.” Don’t forget John Moseley, either. How can I change my vote on “President Mike Schill’s grade so far”? He just dropped from a solid B to a weak D.
Grade changes require submission of the SGR form at https://registrar.uoregon.edu/faculty-staff/grades/changing-grades/supplementary-grade-report-form to our office in triplicate, with each copy wrapped around a bottle of Laphroaig. The AAU held a meeting here in 2003back. Greg Bolt reported it this way in The Register-Guard. “CIA Director George Tenet made a secret visit Monday to the University of Oregon campus, where he addressed a national gathering of university presidents on the role of higher education in solving world problems. Tenet, you may recall, was Director when the CIA introduced its criminal activities of torture. I don’t think that visit did anything good for the UO. Wikipedia is now an official source of information for a National Academy member? What’s next, tweets? UO doesn’t have the research standing otherwise to disregard that perceived prestige if it wants to be taken seriously. Stanford can diss the AAU; UO really can’t. As much hot air that the UO blows about wanting to be a top tier research university, hardly anyone in the administration really knows what that means. As it stands now, the sponsored research part of the university is run by math faculty (VPR and CAS assoc dean for natural sciences). Bless their hearts but they don’t have a clue about sponsored research (the former will be fixed soon with the Conover hire, but the latter will continue to inflict damage until Marcus fixes the problem which I don’t expect to be any time soon). If you want to be a top tier research university, it’s an uphill battle without administrators that know that world. The Old Man has a well founded distrust of “official” sources of information. Perhaps “hmm” can offer a more reliable bit of info on the “benefits” of being an AAU member. Wikipedia is banned in my classes for the obvious reason that it is not accurate. If we are going to discuss important issues (and AAU membership is one), let’s invoke more robust and reliable sources. And with that said I encourage anyone interested in this wikipedia discussion to move it to some other blog. UO already received an AAU inquiry that is a prelude to removal. In describing how colleges work, Birnbaum (1988) noted five cultures: collegial, bureaucratic, political, anarchical, and cybernetic. Everybody knows anarchy reigns at UO – a peculiar source of pride for UOM and its devotees. Anarchy allows extreme narcissism to emerge and culture devolves to nihilism until nothing remains, except perhaps a cameo appearance on the walking dead. What is the nature of this inquiry and is it publically available? University a good example of being cybernetic?